Rutland [Vermont] Police say an armed robber came away empty handed early Tuesday morning. They say a very tall black male wearing a dark hoody approached two restaurant employees as they were making their night deposit at the Citizen’s Bank in the Rutland Shopping Center around 2:30 a.m. The employees said they had already dropped the money off. So the alleged robber left empty handed. Star Wars fans with £74,000 to spare can now buy their very own Ewok-style tree houses. 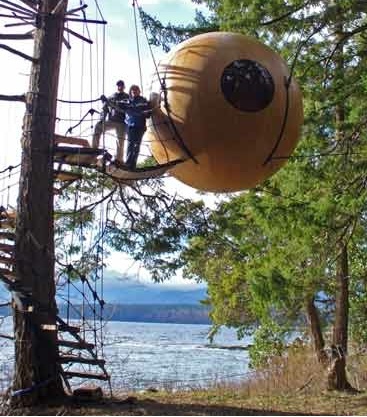 Canadian carpenter Tom Chudleigh’s Free Spirit Spheres are suspended in trees and accessible by rope bridges. The hand-crafted wooden spheres are constructed using boat building techniques and are coated in fibreglass making them waterproof and robust. Inside, they are kitted out with a fully equipped kitchen with a microwave, fridge and sink. The rest of the interior, including loft beds and bronze doors can be custom ordered.